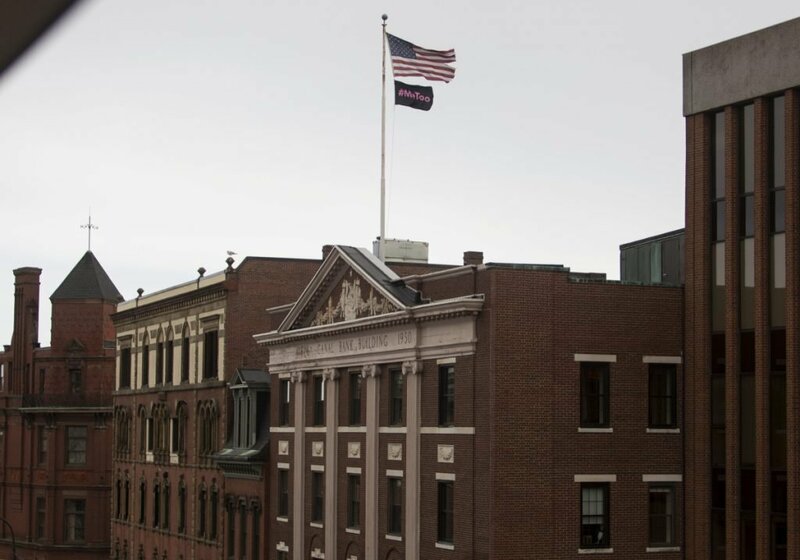 The Old Port building's owner raised the flag during the national drama over Brett Kavanaugh's Supreme Court nomination. 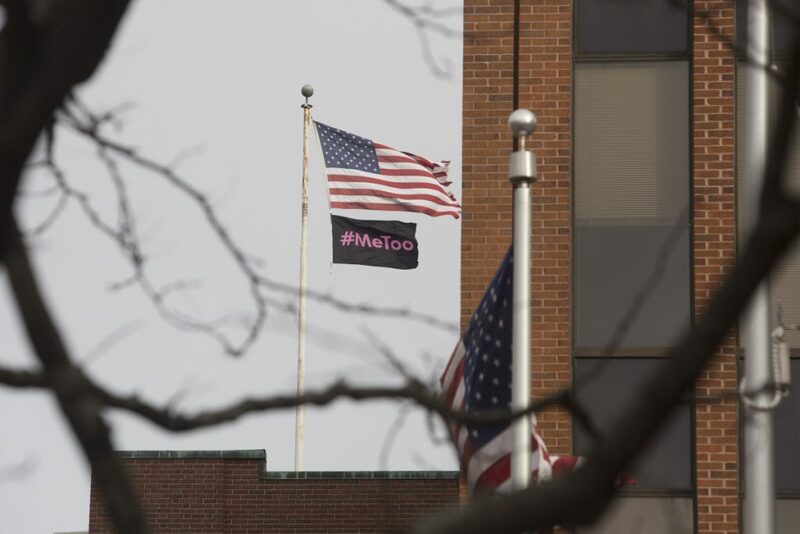 New York real estate investor Fabian Friedland hoped the large #MeToo flag flying on the roof of his Old Port building might dissuade U.S. Sen. Susan Collins from voting for Supreme Court nominee Brett Kavanaugh. It didn’t work, of course. Collins, R-Maine, cast her pivotal vote in early October. But the flag is still there, nonetheless, flying a couple of doors down from Collins’ Portland office. And Friedland now says he may keep the flag there until Collins leaves office. Collins’ spokeswoman shrugged off questions about the flag last week. “We haven’t seen it,” said Annie Clark. The gesture by Friedland, a New York City-based real estate developer who bought the historic group of buildings at 178 Middle St. known as the Boyd Block in 2014, came amid the outcry over the nomination of Judge Kavanaugh to the Supreme Court. Collins was among a few senators who had not committed to a position on Kavanaugh until the time came for his confirmation vote. Kavanaugh’s nomination erupted into a tense national drama after he was accused by a high school acquaintance, Christine Blasey Ford, of sexual assault at a house party in suburban Washington, D.C., when the two were teenagers. Friedland, like so many others, watched news reports as protesters, both for and against Kavanaugh, peppered public officials with phone calls and letters. One of those reports showed a group of protesters outside Collins’ Portland office, which is a few steps away from the Boyd Block. Friedland’s building is perhaps best known as the home of the Urban Outfitters store. Blasey Ford’s testimony, and Kavanaugh’s angry rejoinder before the Senate Judiciary Committee, became an all-consuming political firestorm, with the federal judge’s nomination to the high court resting with the single vote by Collins. Until she announced her position and vote, sign-waving protesters made Collins’ office and the plaza outside her building a temporary home. Her phone lines were jammed with people urging her to vote one way or the other. Friedland’s flag was one more symbol among many. The #MeToo symbol became a movement on social media in 2017 in response to a litany of high-profile cases of sexual harassment and sexual assault against women, especially in the entertainment industry. During the Kavanaugh confirmation debate, #MeToo became a symbol of support for Blasey Ford and a call for senators to vote “no” on the nomination. Friedland’s decision to use the flagpole on top of his Portland building to make a political statement wasn’t the first time it had crossed his mind. He joked about the idea when he bought the building in 2014, he said. “Right after the closing we all shook hands with each other, and I said, ‘Oh, by the way, I’m changing the flag,’ and conversation stopped,” Friedland said. He said wanted to put up a New York Yankees flag. Then silence. “No one thought it was funny in the slightest,” Friedland said.